Since 1977, Faculty of Law has established world's leading law schools and continues to make a mark in the legal profession. Faculty of Law offers an extensive range of programmes. Faculty of Law has a dynamic and expanding research culture. Researchers at Faculty of Law are working in the fields which have potential for real-world impact and change, and tackling problems from a range of perspectives. The Faculty of Law meets the continuing education needs of professionals through various programmes and training. Dr. (Mrs.) Shashikala Gurpur is the Director of Symbiosis Law School, Pune and the Dean - Faculty of Law of the University, Pune since 2007. She holds a Ph.D. in International Law from University of Mysore, Karnataka State Government Award, Gold Medal for topping in LL.M and was the AHRB Visiting Fellow, Edinburgh Law School, UK (2004), selected for Fulbright-Nehru Administrators Seminar, 2011.Prior to 2007. Dr. (Mrs.) Shashikala Gurpur is a distinguished academician and orator. She has an outstanding career with wide ranging experience in teaching, research and industry. Dr. Gurpur holds a Ph.D. in International Law from Mysore University and was the Gold medalist in LL.M. She has worked in MNC, in Abu Dhabi, UAE from the year 2004 to 2007 adding to her industrial experience. She has more than 20 years of teaching experience in various including NLSIU, Bangalore, SDM Law College, Mangalore, Manipal Institute of Communication, MAHE, Manipal and, University College Cork, Ireland. Presently, she is the Director of Symbiosis Law School, Pune and Dean, Faculty of Law, Symbiosis International University. Her teaching interests include Jurisprudence, Media Laws, International Law, Teaching and Research Methodology, Biotechnology Law, Law and Social Transformation besides guiding research for LL.M. and Ph.D. students. She has around 45 articles/research papers, a co-authored book and five book chapters to her credit. 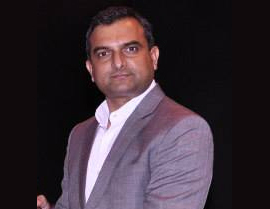 Dr. Gurpur has been a recipient of Fulbright-Nehru International Education Scholarship 2011. Moreover, she has been honoured with Legal Education Innovation Award 2011, conferred by SILF and MILAT. She had also been a part-time member of the 19th Law Commission of India, and is currently a member of the Curriculum Development Committee of the Bar Council of India. 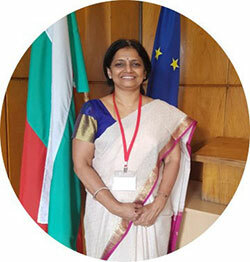 She has been nominated as the member of the General Council of NALSAR University of Law, Hyderabad and a member of the International Advisory Board of Irish Journal - Irish Review of CED Law & Policy, North side Community Law Centre, Dublin, Ireland (2011) & IALS, International Legal Education, USA. In addition, she has attained visitor status to teach in Foreign Service Institute, Ministry of External Affairs, and New Delhi. She is an M. Phil and Ph.D. Referee at Jawaharlal Nehru University, New Delhi. She is also a Ph.D. referee at NLU Jodhpur, Nagpur, Delhi, Saurashtra and Mumbai Universities and, an Examiner at NUJS, Kolkata. She is a member of the Research & Recognition Committee of Faculty of Law, and is nominated for Academic Council of B. P. S. Mahila Vishwavidyalaya, Sonepat, Haryana and Board of Studies, Law Department, Goa University, Veer Narmad South Gujarat University. She has been on the Advisory of All India Radio, Mangalore and several NGOs on Gender, Development and Human Rights and for Asian Network of Women in Communication. She has been recently nominated to the National Judicial Academy’s Academic Council. She has been a resource person at the Maharashtra Judicial Academy and at many UGC courses and other distinguished forum. She is a recipient of the “Award for Excellence in Legal Sector” by Vijay Foundation at Akluj, District - Solapur, Maharashtra along with the special contribution towards empowerment of women & children. She has also been awarded a Certificate of Recognition-- "My Choice for Equality" by the Global Ethics Forum, Geneva in association with IIM Bangalore in the Global Ethics Forum 2014 Conference, at IIM Bangalore among 10 nominees from 50 countries for taking action towards establishing a more equal, impartial and fair world. Symbiosis Law School, Pune stands for excellence in legal education. It was piloted and enriched by the vision of Padma Bhushan Dr. S.B. Mujumdar, was established in 1977 under the illustrious banner of Symbiosis Society. Since 2002, it has been a constituent of Symbiosis International (Deemed University). SLS Pune has been consistently ranked among top 5 amongst more than 1000 Law Schools in India by the India Today-Nielsen and many other rankings. It was also conferred with the prestigious Gold Star Award by the Bar Council of India in February, 2013. This stature is attained through its various programmes and innovative strides. It offers 5-year integrated Undergraduate Programmes like Bachelor of Arts and Bachelor of Laws [B.A., LL.B( Hons)] and Bachelor of Business Administration and Bachelor of Laws [B.B.A., LL.B(Hons)], 3 year LL.B and One year LL.M programme. SLS, Pune also successfully administers 16 different Diploma Programmes and 19 Certificate Programmes. The curriculum and pedagogy are designed around the latest quality initiatives in legal education including recommendations of the Carnegie Report, USA combining skill, knowledge and values. These are imparted through multitalented, qualified, competent and enthusiastic faculty members with the participation of all the stakeholders including the members of the Bar and Bench, corporate sector and international experts. Symbiosis offers an excellent faculty, first rate infrastructure, vibrant student life and stimulating student activities- all of that in one of most industrialized townships of the NCR. The foundations of our Institute are strong enough to withstand the weight of the globalization of professional education. At Symbiosis, we believe in developing high quality human capital that can walk the sharp competitive edge with determination and grit. All the requisite infrastructure and facilities have already been incorporated in our new Institute by taking expertise of the Symbiosis International (Deemed University), Pune and other luminaries of the legal fraternity. We are committed towards developing our campus as one of the finest Law Colleges in India disseminating quality education and achieving academic excellence. The role of law in society is continually investigated through intense intellectual exchange. In fact, role of law in all its ramifications is the most endearing challenge our country is facing, We intend to take up this challenge and impart rational thinking and manufacture not just lawyers, but social engineers. Symbioisis is dedicated to scholarly excellence and to equip our students with knowledge for acquiring fulfilment in law. I am deeply committed towards maintaining and expanding our horizon of world-class education, nurturing the unique community of bright students, faculty and staff. Dr. Chandrashekhar J. Rawandale graduated from the University of Pune with LL.B degree, moving on to complete LL.M in International Law & Human Rights from Dept. of Law, University of Pune, LL.M. in Commercial Law from Cardiff Law School, Cardiff University (UK) and Ph.D. in ‘Computer Programs: Copyright and Patent Paradigms- A Study’ from Symbiosis International (Deemed University), Pune. He lectures on Law of Torts, MV Accident and Consumer Protection Laws, Public International Law, Information Technology Laws to Undergraduates and Information Technology Law & Intellectual Property Laws to postgraduates. He has worked as research associate at I.L.S. Law College for a year where he also taught Law of Torts. He then worked with Bharati Vidyapeeth’s New Law College for two years as a lecturer, before moving to Symbiosis Law School, Pune in 2000. During his stay at Cardiff, he also worked for Welsh Joint Education Board, Wales and Crossroad Solicitors. During December 2003 and October-December 2008, he was a Visiting Fellow at Cardiff Law School, Cardiff and Leibniz University Hannover respectively. Chandrashekhar’s research interests lie in the Intellectual Property Law, Information Technology & Telecommunications Law and International Law. He has co-authored a book on ‘An Introduction to Environmental Law’ in 1998. He was editor for two journals namely, ‘InfoSym-IT & Law Initiative’, ‘Revigorated IPR’ published by Symbiosis Law School, Pune (2000-03). Moreover, he has published number of articles on Information Technology & Intellectual Property Laws, Environmental Laws which include; “Celebrity Culture, Personality and the Quest for Intellectual Property in Image”, Journal of Symbiosis Law College, Volume VII, December 2007; “Online Copyright Infringement and the Liability of Internet Service Providers in UK”, IPR Chronicle, May 2007;“Protection of Non-Conventional Trademarks: EU Experience”, Journal of Symbiosis Law College, Volume VI, December 2006; “A Critical Appraisal of Wildlife (Protection) Act, 1972, Ensym-A Beginning, (2002);“Domain Name Disputes: Problems and prospects” Souvenir, NALSAR, 2001. He is member of 'Project Review and Steering Group (PRSG)' constituted by Department of Information Technology, Government of India for the project “Cyber Crime related Capacity Development and ICT Training for the Judiciary in States of Assam, Manipur, Meghalaya, Tripura, Nagaland, Arunachal Pradesh, Mizoram & Sikkim” by CDAC, Kolkata under Cyber Security Grant-in-Aid Programme. 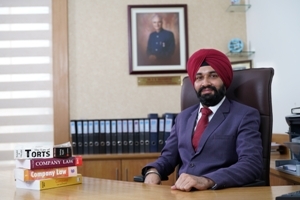 Dr. Sukhvinder Singh Dari holds a Ph.D. in Corporate Laws from Symbiosis International (Deemed University), Pune. He is an alumnus of Symbiosis and has done his LL. M (Business Law) from Symbiosis Law School, Pune. He had pursued his BA. LL.B from the Nagpur University and holds Diploma in Human Resource Management & Labour Laws, and Diploma in Corporate Mergers and Acquisition. Dr. Singh has been with Symbiosis Law School, since 2007. Prior to joining the Symbiosis Law School, Hyderabad as a Deputy Director, he was with Symbiosis Law School, Pune and NOIDA. Presently, he is officiating Director of Symbiosis Law School, Hyderabad. He is a recipient of the Award for "Academic Excellence" contribution to legal fraternity at Legal Desire Summit & Awards, 2018. He has also been awarded a Certificate of Excellence for International Paris Summit Climate Change Program (Centre for United Nation 2016). He has been a resource person at the Andhra Pradesh Human Resource Development Institute and other distinguished forums. He teaches Corporate and commercial Laws, Forensic Science, Constitutional Law, Contract Law, Jurisprudence and Labour Laws besides guiding research for undergraduate and post graduate students. He has chaired and attended plethora of National and International Conferences, with his major research interest in company law and corporate governance. He has National and International publications widely in the area of Company law in leading journals and books. He has many articles/research papers, co-authored books and three edited books to his credit. He is also an editor for International Multidisciplinary Law Journal. SLS, Hyderabad is cocooned in the upcoming educational zone with state of art infrastructure catering impending needs of student community. It is located in the Mamidipalli village Mahabubnagar district, of Telangana near Hyderabad; just 45 minutes away from the International airport and is neighbour to the Tata Institute of Social Sciences [TISS]. SLS, Hyderabad offers five-year integrated undergraduate programmes like Bachelor of Arts and Bachelor of Laws (BA LL.B) and Bachelor of Business Administration and Bachelor of Laws (BBA LL. B) to cater to varied needs of the profession. Website last updated on : November 26 2018 08:46:42.